예천 용문사 감역교지(醴泉 龍門寺 減役敎旨)는 세조 3년(1457)에 내린 교지로, 용문사에 잡역을 면제할 것을 인정하는 사패교지(공로가 있는 자에게 나라에서 부역을 면해주는 것을 입증하는 문서)이다. 이 교지의 내용은 ‘일찍이 감사와 수령에게 지시한 대로 경상도 용문사는 다시 심사하여 더욱 보호하고 잡역을 덜어 주라’는 것이다. 이 교지는 가로 44.8cm, 세로 66.5cm로 국왕의 수결(지금의 서명)이 있는 것으로 조선 전기 용문사의 지위를 살필 수 있는 귀중한 자료로 평가된다. 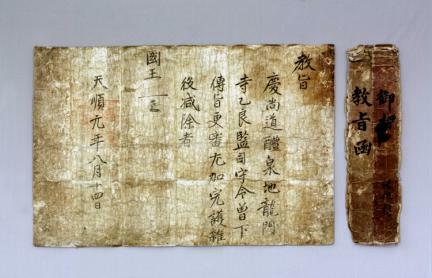 This document, issued in 1457 (the third year of the reign of King Sejo of the Joseon Dynasty), is a royal edict exempting Yongmunsa Temple from compulsory labor duties. According to the edict, the king ordered the local district chief and the magistrate of Gyeongsang-do to take good care of the temple and to exempt it from certain labors and taxes. The edict measures 44.8 cm in width by 66.5 cm in length, and is stamped with a royal seal. 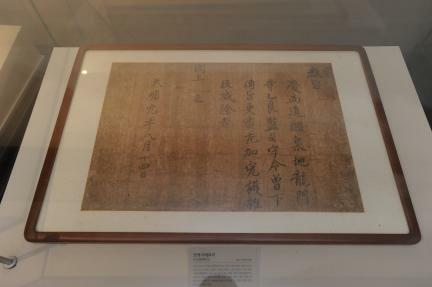 It is regarded as a valuable relic attesting to the high status of Yongmunsa Temple during the early Joseon Dynasty.